How to use Press the square button for five times to turn on the battery, and then long press the square button to get a puff, loosen the square button to stop puff. 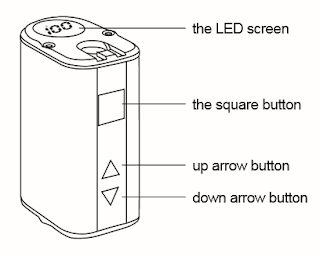 Low-voltage Protection: When the voltage is below 3.3V, the output will shut off automatically, the screen will reflect “%” and “Lo” for 3 seconds, then display current battery level. Unlock the Low-voltage Protection: When the voltage of battery is above 3.65V, the low-voltage protection will be unlocked. Low power Alert: If the power of battery is lower than 10%, both of the symbol “%” and number on the screen will keep flashing. In the end of the battery, there are two laser marks, one named “Eleaf TM” and on the other side is “Mini iStick ”. On the bottom of battery, there is a laser mark named “CE”. Eleaf Mini iStick can be charged through USB port at the bottom of battery. It takes 3 hours to charge the battery with 0.5A wall adaptor, and will take 1.5 hours with 1A wall adaptor. c) When the battery is fully charged, the screen will display “100%” for 10 seconds then go out. d) Unplug USB cable, the screen will display “100%” for 5 seconds then go out.